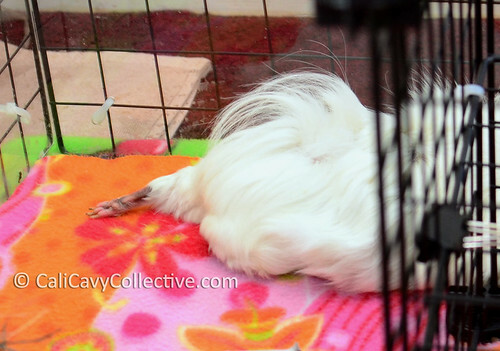 A closeup of Abby-Roo's stretched out piggy paw, with the other strategically hidden underneath her tousled locks. In contrast to the standard all pink piggy foot, Abby-Roo has some interesting coloring going on. Framed by wavy lengths of fur, her toes and soles are pale pink while the edges are shaded a grayish purple hue. No matter the color, that extended footsie still calls for a tickle. Cue one extremely offended peeg. Noah looks hilarious with his paws splayed out behind himself. Love that brown and pink foot, must make nail trimming more convenient! I thought you might like this photo of Noah playing frog! Perky is lying beside him. Ah, the classic frog legged stretch.. always cute and funny to see! Our Noah has one completely brown foot, and when he stretches out like this, he often stretches both feet out, so that he take on the look of a frog! But, Mom! I was comfortable!